This March 10, 1941 recording is not as well-known in the Lester Young canon as it should be. 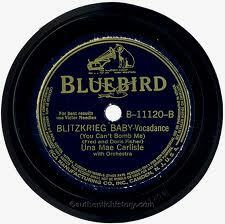 Singer / pianist Una Mae Carlisle, a Fats Waller protege, landed a Bluebird Records date, possibly with the help of Fats. Carlisle was an engaging, low-key singer. How she and Lester Young’s short-lived little band came together in the studio has never been established, but it was fortunate for us and for posterity. If you were a singer looking for the best band in that year, the choice would have been simple, given the perfect accompaniment and solos Lester had been playing with Billie Holiday for the previous four years. The rest of the band — Shad Collins, trumpet; Clyde Hart, piano; John Collins, guitar; Nick Fenton, bass; Harold “Doc” West, drums — was also splendid, although to my ears they sound slightly hesitant, perhaps constrained by their roles in the recording studio. The song (one of four) we are considering is unambitious, its lyrics odd: an attempt to blend current events — the German bombings — with a cautionary love song to an undefined lover. Is the person being addressed an actual soldier or simply someone the singer wants to threaten by violence into good behavior? The lyrics speak of bombing, a hand grenade, a parachute, propaganda, the infantry, a raid, dynamite; the only peaceful comment is about neutrality, which seems forlorn. A perverse romantic utterance at best. But the music shows once again how great jazz musicians and singers make the thinnest material imperishably beautiful. The record begins with a thump leading us into an ensemble passage — a trumpet-tenor riff that would have been well-trodden by 1941. (Quick, on which Louis recording did it first appear?) And the rhythm section, although everyone is pointed in the right direction, is more steadfast than airborne, heavier than the Basie ideal. Carlisle’s cheerful, earnest-though-amused reading of the lyrics lightens the collective gravity, and Shad Collins’ muted arabesques behind her vocal don’t sound like anyone else’s — although muted trumpet behind a singer was also a familiar convention. But aside from his brief appearance in harmony with Collins to start, Lester has been silent. But he emerges into the sunlight in the second chorus, beginning with a simple ascending three-note phrase I associate with the exposition of a twelve-bar blues chorus, then after a brief pause for breath — and space — expanding that initial statement into a line that winds and climbs, not quickly or predictably, taking its time, the notes climbing a stairway that Lester is creating at the moment he ascends and descends, dipping down in the middle of the phrase before climbing easily again. Visually, it might be a line drawn by William Steig. So it might seem that Lester has offered us three improvisations on a simple climbing motif — not surprising, because many solos start low and climb for pure drama. All this has happened in the space of fifteen seconds. Were we watching the original record move on, the stylus and tone arm tracing preordained paths through the grooves, it would seem as if a great distance had been traveled, the needle moving more quickly than the notes, bringing us that much closer to the end of the performance. But Lester thought structurally: a sixteen-bar solo had its own logic, a balance apparent to the ear and would be visible in a transcription to someone who could only observe Up and Down, Long and Short. A more conventional player would have repeated and varied the upwards motif (a trumpet player might have embellished the initial phrase until it would end on an impressive high note) — but Lester’s imagination was more spacious, and by 1941 he had heard thousands of formulaic solos next to him on bandstands across the country. The second half of his too-brief solo begins from a height — although not “high” — that his first exploration has barely hinted at. And Lester, having climbed his imaginary stairway, then proceeds to play on it as if he were a child rolling down those same stairs, one downwards-moving phrase tumbling after another, without haste or urgency, ending his solo with an echo (or a playful parody?) of the first upward phrase with which he began. Lester’s solo is at most thirty seconds long. To ears accustomed to life after Bird, Trane, Ornette, Braxton, it seems simple, unadorned, even plain (leaving aside that dark creamy tone, the rubato hesitations and anticipations too subtle to notate). But like a great Japanese brush painting, its magnificence is in the depths under its apparent ease. Following Lester, pianist Clyde Hart, harmonically subtle and swinging, offers his own version of Basie-and-minimalist-stride that (one says ruefully) seems heavy in comparison with Lester’s ease. When Una Mae Carlisle returns for her second exposition of the lyrics, the horns riff around and behind her: Shad Collins plays straight man to Lester, offering a simple phrase that Lester weaves around rather like ivy twining around a post. I recall what Lester and Roy Eldridge create in the final minutes of Billie Holiday’s LAUGHING AT LIFE. Shad and Lester offer a quiet miniature of the Basie band in performance, the saxophones explaining the truth to the trumpets or the reverse. Lester seems to converse with his friend Shad while the rhythm and the bar lines move along beneath them, until the gentle festivities have to come to an ending. Use simple materials but treat them reverently. No matter how few measures you have to say your piece, make it beautiful. Go your own way but don’t be bizarre for the sake of novelty. Surprise us but don’t shock us. Honor the other members of the ensemble by making sure they sound good. Give everyone a chance to shine. Take your time. Breathe deeply. Do nothing by rote. Float on the rhythm. Even if the lyrics speak of death and imminent destruction, don’t let anyone mess up your cool (to quote Vic Dickenson). And — as a final sad irony — Lester could make beauty out of the impending blitzkrieg, but the Army didn’t see fit to extend him reciprocal courtesies. But on March 10, 1941, he was on his own sweetly winding, hopeful path. We can follow him always.